Q. How long does it take to get my saddle? A. 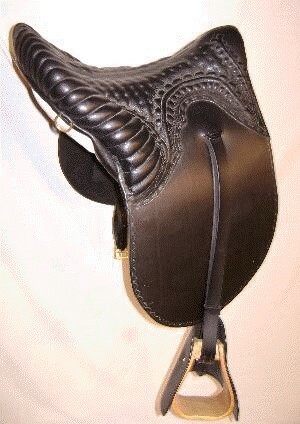 Each saddle is custom made for the buyer; therefore, I seldom have saddles on hand for immediate sale. It typically takes about 30-60 days to fill your order. Q. What does the saddle weigh? A. Weight depends on saddle size, features, leather thickness specified, etc., but most will weigh around 18 pounds, including the hooded stirrups and stirrup leathers. Q. What if I decide I don't want the saddle? A. Just return it in new condition within 10 days for a refund of the full purchase price. Q. Are trial saddles available? A. Yes, just send your check for the purchase price of the saddle and let me know your height, weight, and inseam length. The saddle will be shipped to you pre-paid (in the continental U.S.A.), and you can keep it to ride for 10 days or so. You pay the return shipping and insurance charges. It costs about $50 to $75 UPS a saddle to most parts of the U.S. Obviously, you should treat the loaner saddle with the same care you would expect the saddle to receive if you had loaned one of your saddles to someone. When the saddle is returned, your uncashed check will be sent back to you. A. No. I am a manufacturer, not a retailer, and cannot take trade-ins. Q. Does the saddle come with fittings? A. The saddle comes with military-style hooded stirrups and extra wide stirrup leathers. A girth is not included. A standard two-buckle English girth of the "humane" style is recommended. Q. What kind of pad should I use with this saddle? A. The panels under the saddle are sufficiently padded, so all you really need is just a light pad or blanket to keep the underside of the saddle clean. Q. Do you make any saddles other than the Buena Vista style? A. Occasionally I make "Kentucky Stitchdown" and "Rollback" style saddles. These are very fine and elegant looking saddles and are especially well suited to very short backed horses. Prices vary. (Click here for picture). Q. Do you offer saddle repair services? A. I restuff panels and do repairs on Hillcrest saddles, but do not do repair work on other makes. Q. Do you take credit cards or offer payment plans?